A most wonderful way to freshen the mouth, leaving a lingering exotic, spicy freshness, rather than a clinical antiseptic aftertaste! 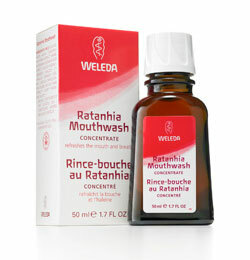 Ratanhia Mouthwash contains Ratanhia extract, Myrrh and homoeopathic potencies for mouth hygiene. Mouthwash's refreshing taste is from an aromatic blend of pure essential oils, including Aniseed, Clove, Geranium, Lavender, Menthol, Peppermint and Sage. With a concentrate of sage, clove, eucalyptus, and peppermint oils, you will only need a few drops in a small glass of water. Use daily to reduce bacteria build-up and bad breath.